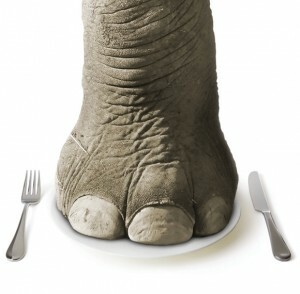 You know how to eat an elephant, right? One bite at a time. When it comes to elephants, we get it – there’s no way we can eat one all at once. When it comes to our own goals however, we tend toward an all-or-nothing approach. (Which explains Blue Monday, a theory by psychologist Dr. Cliff Arnall, who came up with a mathematical formula determining that the third Monday of the year is statistically the saddest day of the year. The best way to get the big win, however, is to start small: modest, consistent progress almost always trumps all-out, dramatic efforts. Starting small sets you up for success (there’s nothing that says you can’t scale up as you acclimate!). Inevitably, all-or-nothing thinking – which, by definition, means going from 0 to 100 — creates inertia. Breaking a big goal up into micro-goals may mean less bragging rights (sorry, Ego!) but it busts through the wall of inertia. Once you start taking small steps, momentum kicks in and it actually becomes easier to keep moving forward than to stop. At BUD/s training, Navy SEAL candidates are taught to “segment” — rather than thinking about how they’re going to get through the next five days of Hell Week, to focus on the micro-goal of getting to the next meal, the next evolution. This is exactly what my violinist sister found as she was counting down the last three months before returning to her post at the Paris Opera after several years focused on raising her children. By practicing every day – even if only for 15 minutes – she showed up at the first rehearsal feeling confident and in control. Check out this example of how he found hidden pockets of time to exercise while the eggs are boiling, a TV commercial is playing and his kids are putting on their soccer cleats. How can you micro-cize your thinking?